Go here for more about Elizabeth Cady Stanton. Go here for more about Elizabeth Cady Stanton's Declaration of Sentiments speech. 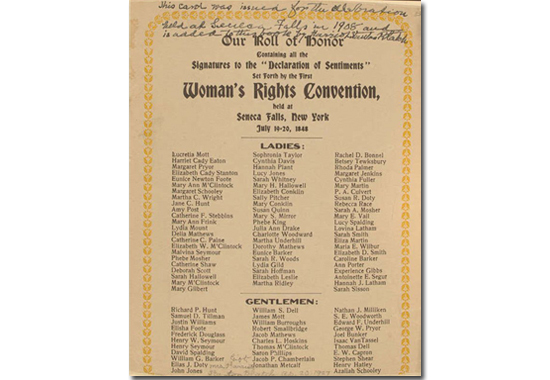 Our Roll of Honor, signatures to the Declaration of Sentiments set forth by the First Woman's Rights Convention held at Seneca Falls, NY, July 19-20, 1848, with emendations by Elizabeth Cady Stanton's daughter Harriot Stanton Blatch (1856-1940) — U.S. Library of Congress. It follows the full text transcript of Elizabeth Cady Stanton's Declaration of Sentiments, as published in the History of Woman Suffrage by Stanton et al. The Declaration was delivered at the Seneca Falls Convention, New York — July 19-20, 1848.
it becomes necessary for one portion of the family of man to assume among the people of the earth a position different from that which they have hitherto occupied, but one to which the laws of nature and of nature's God entitle them, a decent respect to the opinions of mankind requires that they should declare the causes that impel them to such a course. Prudence, indeed, will dictate that governments long established should not be changed for light and transient causes; and accordingly all experience hath shown that mankind are more disposed to suffer, while evils are sufferable, than to right themselves by abolishing the forms to which they were accustomed. But when a long train of abuses and usurpations, pursuing invariably the same object, evinces a design to reduce them under absolute despotism, it is their duty to throw off such government, and to provide new guards for their future security. Such has been the patient sufferance of the women under this government, and such is now the necessity which constrains them to demand the equal station to which they are entitled. He has made her, morally, an irresponsible being, as she can commit many crimes with impunity, provided they be done in the presence of her husband. In the covenant of marriage, she is compelled to promise obedience to her husband, he becoming, to all intents and purposes, her master — the law giving him power to deprive her of her liberty, and to administer chastisement. Resolved, That inasmuch as man, while claiming for himself intellectual superiority, does accord to woman moral superiority, it is pre-eminently his duty to encourage her to speak and teach as she has opportunity, in all religious assemblies. Resolved, That the objection of indelicacy and impropriety, which is so often brought against woman when she addresses a public audience, comes with a very ill-grace from those who encourage, by their attendance, her appearance on the stage, in the concert, or in feats of the circus. Resolved, therefore, That, being invested by the Creator with the same capabilities, and the same consciousness of responsibility for their exercise, it is demonstrably the right and duty of woman, equally with man, to promote every righteous cause by every righteous means; and especially in regard to the great subjects of morals and religion, it is self-evidently her right to participate with her brother in teaching them, both in private and in public, by writing and by speaking, by any instrumentalities proper to be used, and in any assemblies proper to be held; and this being a self-evident truth growing out of the divinely implanted principles of human nature, any custom or authority adverse to it, whether modern or wearing the hoary sanction of antiquity, is to be regarded as a self-evident falsehood, and at war with mankind. Resolved, That the speedy success of our cause depends upon the zealous and untiring efforts of both men and women, for the overthrow of the monopoly of the pulpit, and for the securing to woman an equal participation with men in the various trades, professions, and commerce. The only resolution that was not unanimously adopted was the ninth, urging the women of the country to secure to themselves the elective franchise. Those who took part in the debate feared a demand for the right to vote would defeat others they deemed more rational, and make the whole movement ridiculous. But Mrs. Stanton and Frederick Douglass seeing that the power to choose rulers and make laws, was the right by which all others could be secured, persistently advocated the resolution, and at last carried it by a small majority. Thus is will be seen that the Declaration and resolutions in the very first Convention, demanded all the most radical friends of the movement have since claimed — such as equal rights in the universities, in the trades and professions; the right to vote; to share in all political offices, honors, and emoluments; to complete equality in marriage, to personal freedom, property, wages, children; to make contracts; to sue, and be sued; and to testify in courts of justice. At this time the condition of married women under the Common Law, was nearly as degraded as that of the slave on the Southern plantation.